Pictiúr den dá phríomhthúr san Ionad Trádála Domhanda, sé mhí sular leagadh iad. Ba ghrúpa foirgneamh ilstórach é an tIonad Trádála Domhanda (Béarla: World Trade Center (WTC)), suite i Nua-Eabhrac. 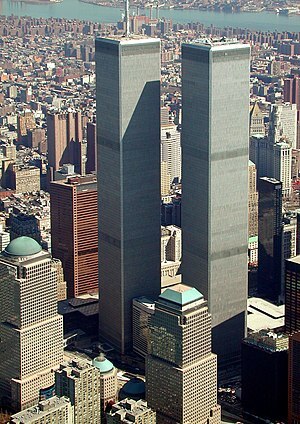 Leagadh go talamh an WTC in ionsaí sceimhlitheoireachta 9/11, ar an 11 Meán Fómhair 2001. Níl an áit ina raibh an tIonad Trádála Domhanda suite ach coiscéimeanna ón áit a bhfuil an t-ionad cuimhneacháin, an "Irish Hunger Memorial", i Battery Park City ag Vesey Street agus North End Avenue, ar bhruach Abhainn an Hudson. Bhí seacht bhfoirgneamh ar fad ann. Minoru Yamasaki, ailtire Meiriceánach, a dhear an t-ionad don Port Authority of New York and New Jersey (PTA). D'osclaíodh go hoifigiúil an WTC ar 4 Aibreán 1973. Sa bhliain 1993, maraíodh seisear nuair a phléasc buama i ngaráiste páirceála faoin World Trade Center. Ar an lá sin, tháinig an Gael-Mheiriceánach Eamon J. McEneaney slán as an Ionad Trádála Domhanda mar laoch: "nuair a phléasc buama faoin dá thúr ar an lá sneachtúil sin, threoraigh McEneaney suas le 60 duine dá chomhoibrithe trí staighrí dorcha a bhí lán toite go dtí go raibh siad slán sábháilte". Leagadh go talamh an WTC in ionsaí sceimhlitheoireachta 9/11, ar an 11 Meán Fómhair 2001. Tá go leor searmanas i gcuimhne orthu siúd a cailleadh san ionsaí sceimhlitheoireachta. I measc na ndaoine a rabhthas ag cuimhneamh orthu ag na hócáidí sin, bhí póilín de bhunadh Éireannach, Stephen Driscoll. Tá foirgnimh ilstórach ar an suíomh anois, 1-7 World Trade Center ", in éineacht le cuimhneachán do na daoine a fuair bás sa tragóid, agus músaem faoin ionsaí 9/11 agus modh iompair an WTC. An WTC nua: Tá foirgnimh 1 agus 4 le feiceáil i lár an phictiúir. Tugadh an leathanach seo cothrom le dáta an 5 Feabhra 2018 ag 16:54.